Shatterproof! The ancient amphora shaped vase is revamped in our new, handmade iron & glass mosaic floor vase. A beautiful & sturdy vase; each weighs just under 6 lbs. so they are not easily knocked over by small pets & kids. Hand-crafted in India, composed of metal and featuring diamond pattern glass mosaic with a transitional style "Ombre" pattern decorating the surface. The mosaic glass tiles range gradually ascend the exterior beginning with a rich brown, transitioning to a golden caramel, and graduating into a pearlescent silver base. The neck & lip are decorated with this color theme in a square mosaic with coordinating colors. 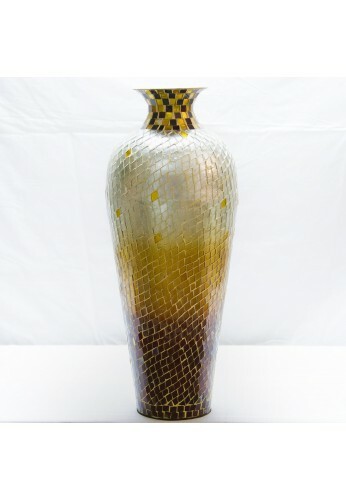 Shimmering glass mosaic tiles grace the exterior of these amphora shaped shatter proof vases that provide the ultimate collector decor in your home, office or commercial decorating project. Combining the ancient arts of metallurgy and pottery creation, our artists hand-mold each aluminum vase. Each vase is finished using diamond patterned mosaic glass tessellation, creating stunning visuals that begin to transform your space into an in-home gallery. The artistic look and durable construction are just a few of the features you'll love. An ample 2" opening in a 4" lip leave plenty of room for decorative items; reeds, greenery, floral arrangements & more. However, make no mistake...our Amphora Nouveau Artware Vases make a statement all their own! 20" floor vase or decorative accent vase in a modernized, artistic Amphora shape.